NY Party Works has been helping clients plan autumn parties since 1993, and we have the party rentals and services to make your event memorable. We want to show you why we’re the first place to stop for your fall event. 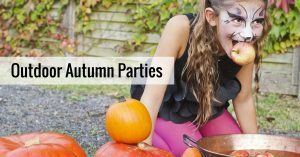 The temperatures may be dropping, but there’s still plenty of chances for outdoor fall fun with NY Party Works Inflatables. If you’re planning an event for children, our bouncers and slides are ideal. We have 20 X 20 bouncers that give children space to burn energy! They’re great for fall festivals. And we have spectacular inflatable slides such as a 24-foot Patriotic Double Lane Slide. It reaches high in the air and it’s a great trip down. Another great way to celebrate outdoor fun in the fall is to create a carnival theme. NY Party Works has everything you need. We have traditional Carnival Booths with red and white stripes. We can provide you with performers such as magicians, fortune tellers or circus performers. We have rides such as our classic spinning Tubs of Fun attraction which is great for both kids and adults. We can also provide you with traditional carnival food. Want a carnival staple? Try our Cotton Candy Cart or Popcorn Machines. It’s great to take advantage of the fall season. The Lubbock Avalanche-Journal suggests using the cooler air to switch to fall themes. Add things like hot apple cider to your drink selection. Toast marshmallows and make s’mores. Decorate in fall harvest colors. One great fall party feature is to show an outdoor movie. NY Party Works has you covered with our Inflatable Drive In Screen. It’s just like an old-time drive-in with some hi-tech twists. This 16 by 9-foot screen can be used for both school festivals and outdoor parties. It also can be hooked up on X-Box and PlayStation games as well. At NY Party Works, we can also provide you with tents as well as tables and chairs for your fall party. Tents range from 15 X 15 or 20 X 20 all the way up to larger setups. We can also help you configure them. We also offer round tables, long banquet tables, table linen, chairs and chair covers whatever you need, ask us. A slight drop in temperature doesn’t mean your fall party can’t be hot. At NY Party Works we’ll always have the hottest party rentals for whatever type of event you’re planning. To get started, contact us today.